In the words of the fame acadamy turned viable entertainer Lemar - this week it is 50/50. It is true i was busy, too busy infact to check my mails and get everything organised - however i have to say that aside from one individual the rest of you were flaky with your responses - 'can i let you know' - you know who you are and you should be ashamed! 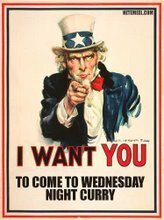 N E Way i have decided that i have to be kinder and giving you chaps a little advance notice....so fridays will hopefully be the wednesday night curry e-mail day! I will be back on track v.soon sorry for the delay in spicy goodness.